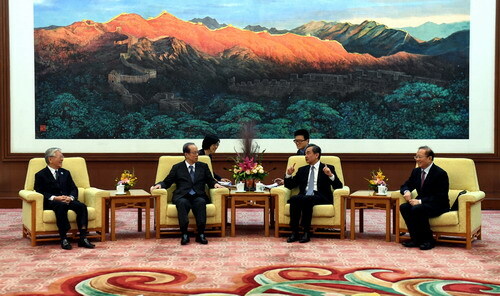 On October 10, 2018, State Councilor and Foreign Minister Wang Yi met at the Great Hall of the People with Former Prime Minister Yasuo Fukuda of Japan and representatives from economic circle of the Japanese side, who were in China for the fourth round of dialogue between entrepreneurs and former senior officials of China and Japan. Wang Yi expressed that this year marks the 40th anniversary of the signing of the China-Japan Treaty of Peace and Friendship. Four decades ago, it was Mr. Yasuo Fukuda's father, then Japanese Prime Minister Mr. Takeo Fukuda and Mr. Deng Xiaoping who jointly signed the China-Japan Treaty of Peace and Friendship, which confirmed various contents of the China-Japan Joint Statement in legal form, including basic principles on handling issues related to history and Taiwan, and consolidated the political and legal foundation of China-Japan relations. The Treaty also clarifies that both sides oppose hegemony and also oppose any third party seeking hegemony in the region. Ten years ago, Mr. Yasuo Fukuda, then Prime Minister of Japan, signed the fourth political document with the Chinese leader, clarifying that China and Japan should regard each other as cooperative partners rather than threats and support each other's peaceful development. These principles are still of great immediate significance today. Both sides should inherit the past and usher the future, consolidate the political and legal foundation of China-Japan relations and confirm the important consensus of regarding each other as cooperative partners, so as to open up a new blueprint for the future development of the relations between the two countries. 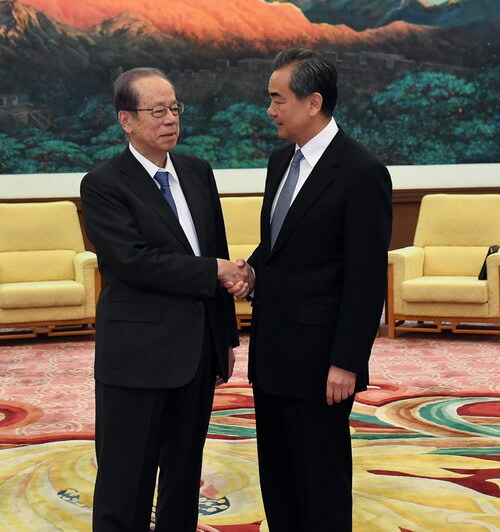 Yasuo Fukuda agreed on this and stressed that the sustained and stable development of Japan-China relations is not only of great significance for Japan and China, but also will have an important impact on the entire East Asia and the whole world. Both sides should make joint efforts and never let Japan-China relations get lost. We are willing to play an active role in this regard. At the same time, the Japanese side hopes to participate in China's new round of reform and opening up process in an in-depth manner.